“Eat It” was the decisively-titled Humble Pie album that made its chart debut exactly 43 years ago and progressed into the top 15, during a five-month chart run in the US. The album saw the British rock band growing ever more confident and autonomous. 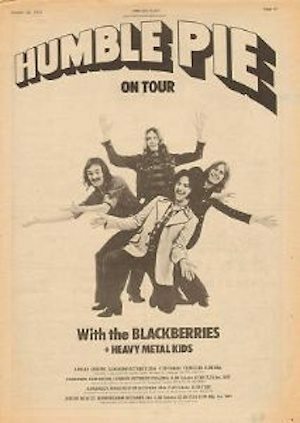 A double LP and their seventh studio release, Eat It was the first Humble Pie record to be made in Steve Marriott’s new home studio, Clear Sounds, in Essex. What resulted was a set showcasing the group’s influences in an ambitious and imaginative way. This album showcases the dynamic diversity and talent of Steve Marriott’s gritty bluesy vocals with some funky soul mixed in throughout along with straight ahead blistering rockers. The band is right on and they deliver an extremely energetic powerhouse combination on this double album that overall ranks with their best along with Smokin’ and Performance Rockin’ The Fillmore.